Choose a desk frame color to match your office decor. We have accessories to match your frame color for a unified look and feel. Pick your frame's width. The standard frame works for most desktops, but if you have a narrow top, choose the narrow frame width option. Add a free accessory to your order! We offer a selection of items to keep your new workspace ergonomic and organized. 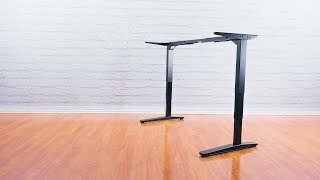 The UPLIFT Height Adjustable Standing Desk Frame is offered with two different styles of electric sit stand desk frames: a 27" foot option for 30" or deeper desktops, or a 24" foot for desktops with shallower depths. Choose your frame width to fit the desktop you'll be pairing it with. We find that the standard frame width, which telescopes to fit desktops anywhere from 43'' to 96'' wide, works for most people, but if your desktop is narrower than 43'', we offer shorter crossbar ends that will fit tops as narrow as 26''. The standard width frame comes with optional center rails that can be removed if you would like to mount a longer keyboard tray track. Please note: all dimensions given are assuming desktop is at least 1'' thick and made of a durable material. We know you're never content with just average—so when you're looking for the most advanced sit-stand desk on the market, start at the bottom, with the frame. Made with the same frame that Wirecutter and Forbes both named the "Best Standing Desk," you'll be able to do so much more at this workstation—thanks to increased stability, newly-added safety features, and a patent-pending mounting system (which lets you really customize your desk down to the last detail). Enjoy working at this powerfully reliable desk frame. Made with steel and sealed with a powder-coat finish, this frame gives you carte blanche for your desktop, meaning that you can DIY it or choose one of ours. If you're looking for this frame and a desktop, see our UPLIFT V2 Standing Desk. You can choose this frame or the UPLIFT V2 Commercial Frame. Click here to see the contrast between the two frames. Looking for a different config? Try our UPLIFT V2 L-Shaped Standing Desk Frame or our UPLIFT V2 4-Leg Standing Desk Frame. We're excited to give users two different frame options when it comes to their desks: the UPLIFT V2 Frame and the UPLIFT V2 Commercial Frame. Click here to see their differences at a glance. We'll start with the UPLIFT V2 Frame. This office-ready frame has a height range of 25.5" - 51.1" (with a 1" desktop installed). Users love it for its sturdiness, its quiet adjustments, and its smart features—which are just a few of the reasons why it was selected as the "Best Standing Desk" by Wirecutter. Our other frame option is the UPLIFT V2 Commercial Frame. This frame has a lower minimum height of 22.6" (with a 1" desktop installed). It also has a larger overall height-adjustment range compared to the UPLIFT V2 Frame. And you'll be glad to know it meets both the ANSI/BIFMA G1-2013 height standard and the ANSI/BIFMA durability standard. The commercial frame also supports working postures for 5th percentile females through 95th percentile males, sitting and standing. If you look underneath your new UPLIFT V2 Sit-Stand Desk Frame and see a team of holes—you just found our patent-pending mounting system. These spots let you use your desk with a growing collection of desk accessories, and remain discreetly hidden, so you keep a clean look at your workstation. Your accessory options are many, and include attachable CPU holders, a foot hammock, power strips, and even an under-desk hammock. This is perfect for when you're in the mood to take a load off (and maybe even a mid-afternoon nap). With a wide array of accessories planned for release, you'll be able to piece together the perfect workstation that works for you. Please note: the under desk hammock is only compatible with the UPLIFT V2 Frame. It’s not compatible with the UPLIFT V2 Commercial Frame, due to its interference with the stability crossbar. Our standard keypad will get you working, but if you want access to all of your desk's features, you'll need the Advanced Keypad. This desk has a great memory, and lets you work with one-touch adjustments on four easy-to-program buttons. Just tap a button and move. You'll get advanced safety features, too. Activate the keypad child lock so that curious little fingers don't adjust your desk without your permission. And set your frame's max and min height limits, preventing your desk from knocking into shelves above, or file cabinets below. If it does bump into something, the control box has an anti-collision sensitivity feature that stops the desk from moving. Last but not least, an auto-dark LED display will help you reduce distractions; 10 seconds after use, your keypad will dim to focus-assisting darkness. Warranty 7-year all-inclusive warranty on entire desk frame: motor frame, controller, keypad, electronics, and mechanisms included. Extension to 12 years available. What types of desktops can I install on this frame? You'll have the freedom to install most types of tops, but we do advise choosing a desktop that's at least 3/4" to 1" thick and 42" to 80" wide. The top you choose will also need to be compatible with wood screws, which are used to connect the frame to the desktop. Some good desktop materials that we've found to be ideal include: solid wood, laminate, bamboo, and other sturdy materials. Is it possible to add a circular desktop? We have seen our customers install circular tops, yes! Just make sure your top is at least 3/4" - 1" thick and is centered on top of the frame. Can I install a glass desktop? Glass is a little trickier to install, but if you have a bit of experience with DIY, you might be able to install a glass desktop that has been first installed on another material (like wood). This will allow you to successfully attach it to the UPLIFT V2 Stand Up Frame. Does this come with the hardware needed to attach a desktop to the frame? Yes, your new frame will include the wood screws necessary to attach your frame to your desktop. Just double-check that the wood screws are not longer than the desktop is thick before starting the installation process. Can I paint my frame? No, painting the frame would compromise the leg as it retracts. Just finished assembling one of my new Uplift Desks with the 30 x 60 1" thick bamboo tops. I'm very pleased with the quality. This desk is solid, you have to really work to shake it and get monitor wobble. There's no movement from typing or mousing at 46" high. All finishes are pretty and the unit is quiet while rising or descending. Jessica at Human Solutions was a pleasure to deal with as well. Pros: Solid, heavy, quiet and very nice looking. I've been suffering from lower back pain and my wife suggested getting a stand up desk. I looked at many different options, but stopped by the Austin showroom and was sold!! Motorized, gorgeous reclaimed wood top, very helpful staff and amazing delivery/set up team. Can't recommend this place strongly enough! Pros: Lower back pain gone. Beautiful design, very easy to setup. I did not want to junk my existing desk, and found this to be a very neat solution. Very easy to assemble, very smooth operation, and really nice design. Love it! So I bought the base, bought (from a local shop) a wormy maple top (60X30 inches), and I do love it. I stand I think more than I sit, though it's great to be able to sit too. However, I did want to mention -- I wasn't sure if I should get the casters, but I did, and that has proven to be a good idea. You can easily move the table for cleaning, and it was useful during the wiring portion of the installation too. - George PS, the CPU holder works great too. This was a great purchase. Smooth operation. Very easy to put together. Great functionality. no problems at all lifting desk with all my junk on it (printer, phone, modem, router, monitor, speakers, and computer attached underneath. I've done an extensive market research about my options when it comes to a standing workstation, and this one is an absolute winner, considering the quality, usability, and affordability. Nothing comes close. Easy to set up, solidly built, motors do the job quickly and quietly. I reused my old IKEA desk top, and I couldn't be happier with the result. The setup makes me want to work! The best Sit down Stand Up desk for the $$$. No one comes close. Took literally an hour to set up on a 2 x 6 foot board. Spend most of my time standing. Has improved my posture, my back and the thing is genuinely fun. Seriously easy to assemble. Never an issue. Buy one now! I bought the frame only and made my own desktop. Came packaged well, organized and super easy to assemble. The operation is flawless and solid as a rock. The base came very quickly, was well packed and was exactly as advertised. It was extremely well made, easy to put together and operates flawlessly. I looked at a lot of options, and I am so very happy that I went with a full electric desk. It is truly the best option, I would not have been happy with a solution that just raised and lowered the keyboard and monitor. Kudos on an outstanding product at the absolute best price. I now find myself standing much more than I sit each day, and my fitbit tells me that I have doubled my normal work day steps. I was able to use your tools and guides to finely tune and customize the height to be exactly where I need it - sitting or standing. It works so well for my office/work experience, that I am thinking about another one for my personal/family space. $399.00 List Price: $759.00* The list price is the same as the MSRP (Manufacturer's Suggested Retail Price). It may not necessarily be the price at which the product is sold.